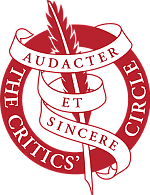 The Critics' Circle is the world's oldest body of critics, established in 1913 and made up of six sections: art, books, film, dance, music and theatre. As vice chair of the film section, I'm on the overall council. And as chair of the film awards, I'm heavily involved in running our ceremony. Unlike the Oscars or Globes, we have some 155 members who watch almost all of the movies and vote on what we admire rather than trying to follow the buzz or being lured by over-hyped films. London critics tend to vote just a little against the grain, which is refreshing even if it leaves us open to accusations of snubbery! For example, why did A Star Is Born and Green Book fail to get even a single nomination from us? Lots of members voted for them, but not enough to beat films critics genuinely rated higher. Meanwhile, we have a nicely diverse set of nominations, including two women up for director and some superb suprises in the acting categories, as usual. And the winners list is packed with nice touches as well. Rich Cline has been a Critics' Circle member since January 2003, and awards chair since 2012. W I N N E R S . . .
N O M I N E E S . . .